There are no two ways about it- there will be spoilers in this review. 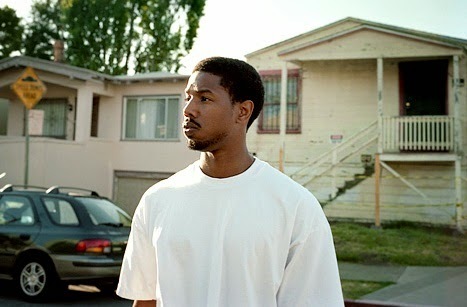 Writer-director Ryan Coogler puts the climactic event of Fruitvale Station in its opening shot, using real life camera-phone footage of the incident before ceding into his 24 hour biopic, so if you don't know the story when it comes to Oakland resident Oscar Grant III and New Year's Day 2009, then you'll either want to go and see the film first or proceed carefully from here to the end of the review. Coogler's film takes place in the last 24 hours of Oscar's life, making a late start on his resolutions for 2008 on his mother's birthday, which happens to coincide with New Year's Eve. He's recently got back together with the mother of his child after a bout of infidelity and even in the face of being fired from his job at a butcher's counter, he has resolved to stop selling drugs to support his family. We know, but he doesn't, that he's headed for a fatal confrontation with the police at the titular train station, as we watch him try to turn his life around. 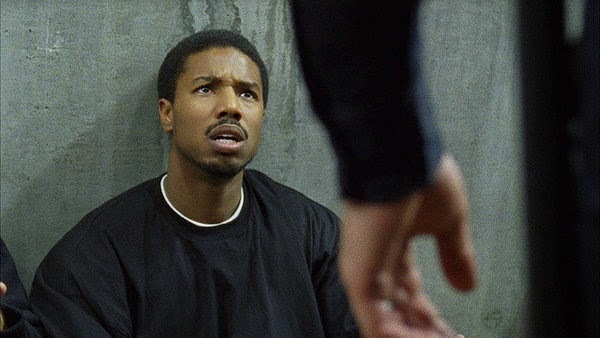 Your appreciation of Fruitvale Station will depend entirely on how you feel about emotional manipulation. Whether they're open about it or not, films are meant to be emotionally manipulative- not every film has to be as cloying and desperate as a Marley & Me, but there's no enjoyment in being aloof, arms crossed and indifferent as a default mood. Oscar's story is undeniably tragic and Coogler has slathered it with dramatic irony in a way that some may find unpalatable, if not straight up unbelievable. The confluence of circumstances that lead Oscar into the train station feel almost a little too contrived, but it seems impossible to be anything other than respectful to such a recent event. The dodgy thing about the creative licence being taken with certain aspects is if you look on open-mouthed and say "That wouldn't happen", there's the fallback of that shaky candid footage of the actual shooting as if to solemnly say "Well, this happened." Luckily, the film is good enough for us to give the benefit of the doubt to its devastating poignancy and to accept that truth is sometimes stranger than fiction. Michael B. Jordan's lead performance is a tremendous credit to the dramatisation of these events. He's given a leg-up by the fact that the film is eager to portray Oscar as a good guy who just hasn't fulfilled his potential, and as scripted, he teeters on the edge of sainthood, but Jordan brings more to it than that. After the first hour, by the time things start spiralling towards their conclusion, you start hoping against hope that maybe things will turn out differently. You really don't want him to die. The strong supporting cast is led by Octavia Spencer as Oscar's long-suffering mother, Melonie Diaz as his exasperated girlfriend and the adorable Ariana Neal as his four-year-old daughter. By the time the cops arrive, headed up by Kevin Durand and Chad Michael Murray as the most recognisable of the aggressors, they might as well be accompanied by the Imperial March, but this is not the film's undoing. If anything, it's from this point to the end where the film packs the most power and any movie tropes that might have seemed false or convoluted up to this point entirely give way to the climactic emotional wallop. 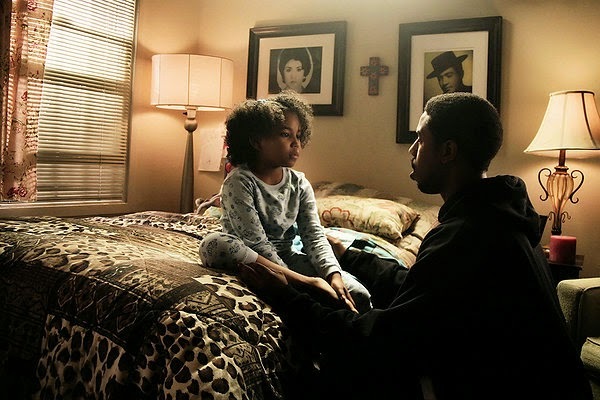 From an emotional point of view, Fruitvale Station has the feel of a film that spends an hour pulling its punches before throwing a blinding left. In pulling off the difficult trick of dramatising such a recent event, Coogler places massive importance on chance encounters, some of which come back at the end and others which serve the dramatic irony- neither of the people involved know that this is one of the last conversations Oscar will ever have. A powerhouse cast and a short, sharp, almost perfunctory running time (barely 80 minutes without credits) ensure that the desired effect is achieved. Fruitvale Station is now showing at selected cinemas nationwide.